I was driving to work one day and someone changed lanes and ran me into the center guardrail on the freeway! Nobody stopped, nobody tried to pull over and ask if I or the other party were OK. As hundreds of people streamed past at 65 miles per hour , I realized how greatful i was that neither I nor the lady who had run me into the guardrail were injured seriously.I imagined how easy it would be to get my car repaired, because she had insurance. Everything changed when I contacted her insurance company, you see, she told her adjuster that I ran into her. I had no witness and no proof that she had run me into the guardrail.So...6 months later, and with still no resolution in sight, I created this web site that you can use to report an accident and potentially get paid should an individual or an insurance company need the information you submit in your email. 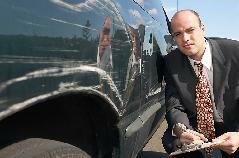 Insurance fraud is a crime and punishable by fines and inprisonment. Please carefully consider what you are about to do. Briefly describe the accident you witnessed.Please include the approximate time, date , location , and description of the vehicle(s) involved. Include in the description color, size, make, model, year, etc... Was the vehicle a car, pickup, SUV, van, station wagon, big rig, motorcycle, etc...? What were the weather conditions and road conditions at the time of the accident example : dry , warm , wet , overcast , sunny , windy , etc...? What direction were the vehicle(s) traveling example : north , south, east, west, or toward what geographical area like the hills or San Francisco or the beach, which vehicle did what, where did they end up. Basically just give a detailed account of what you saw occur.